The Washington Nationals third attempt in five seasons to break out of the Division Series came to a screeching halt Thursday evening, with the Los Angeles Dodgers powering their way through Nationals Park en route to an LCS meeting with the Chicago Cubs. Meanwhile, ALCS play begins tonight, with the Toronto Blue Jays slight favorites over the home field Cleveland Indians. With last night's victory, Clayton Kershaw & Co. improved their World Series expectancy to 12%. They will nevertheless be strong underdogs to the Cubbies. The North Siders remain the best team in Major League Baseball. Thanks largely to their dominant record and in part to Chicago's home field advantage in the NLCS, my simulator only picks the Dodgers to advance to the World Series in 29 out of every 100 simulations. 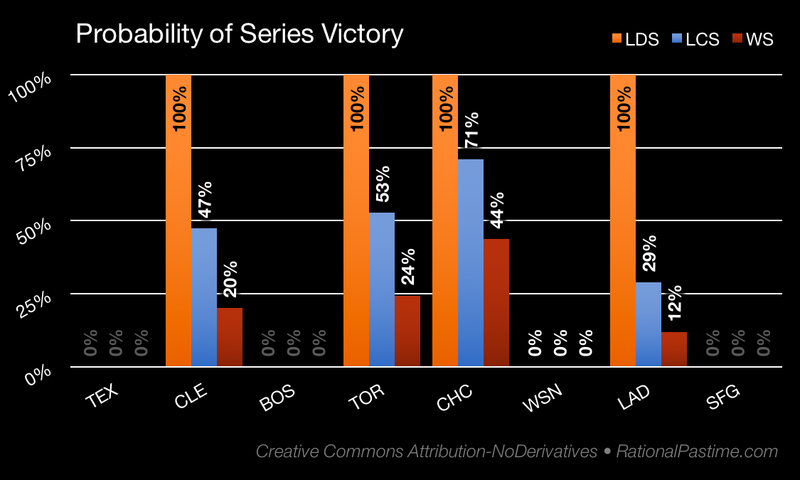 LA's best bet is to force a seventh game, while Chicago is most likely to win at home in game six. 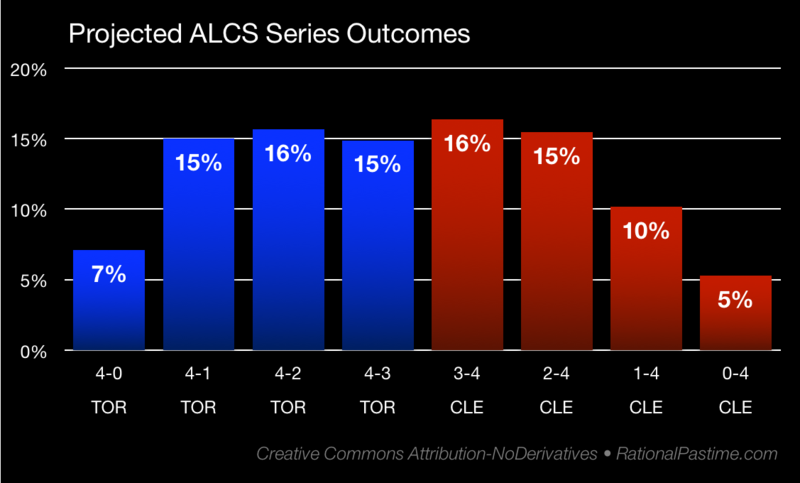 The ALCS is a far more evenly-matched contest on paper. The Blue Jays, thanks to their superior RPScore, win 53 out of every 100 simulations. The Indians' best bet is to force a seventh game at home, while the Jays' best shot is a win in game six in Cleveland. With the exception of the Dodgers, my simulations generally agree with Pinnacle's betting lines as of 10:30 ET Friday. The markets continue to expect more from the Dodgers than my models. So far that has not been a bad bet. 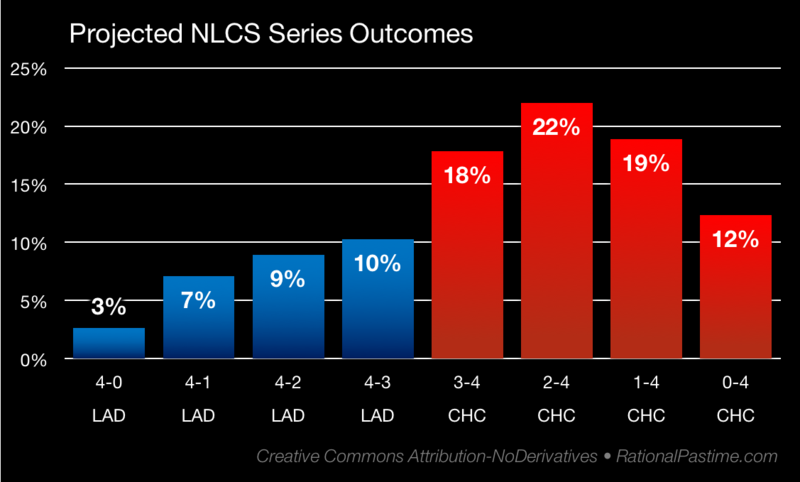 Among all possible World Series outcomes, the single most likely is a Cubs win over Toronto in five. 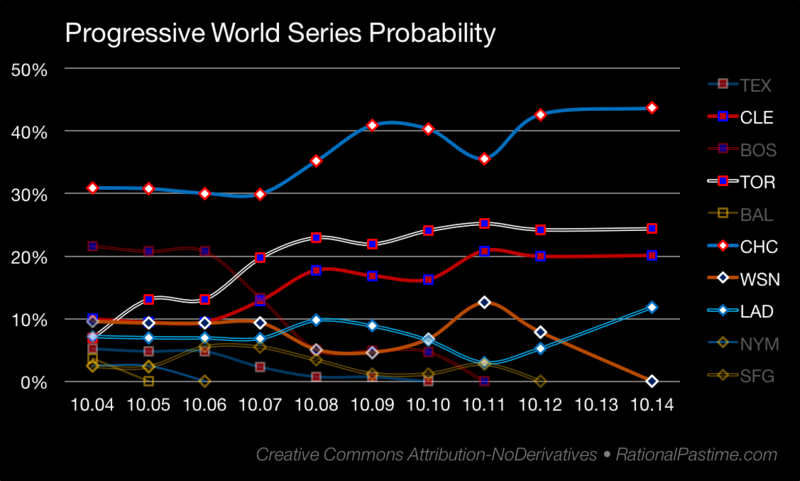 Check back tomorrow to see how the first game of Championship Series play effects the World Series chances of all four surviving MLB teams.